Portable Espresso Coffee Maker – Welcome to Cool and Crazy Gadgets! Welcome to Cool and Crazy Gadgets! Explore the world of crazy, unique and unusual gadgets! Do you find yourself on a long car journey and just crave a desirable cup of comfy warming coffee? Well this coffee maker has you in mind as it’s elegant, sleek and compact design allows you to comfortably place it in the console next to your driving seat. Are you an avid coffee lover and enjoy getting yourself around by bike? Then enjoy a hit of coffee at your own convenience as it perfectly fits in your bottle cage with ease. Share a cup of coffee at those special moments with family and friends whether your enjoying a picnic or adventurously camping, pour a cup in an instant! Integrated with a high pressure pump at 15 bar pressure, this coffee maker elegantly releases the full flavour and charming aroma’s from the compact coffee capsules, to provide you with a barista-style coffee experience. Pour a deliciously creamy and enriched premium coffee at the touch of a button. This machine is powered and fully operated by a rechargeable lithium battery, which enables you to charge your Portable Espresso Coffee Maker with a 12V car charger, ideal for when you’re commuting long distances by car. Have you ever been camping, or out adventuring in cold baltic temperatures, and without hot water? Well this device is highly efficient taking just 8-10 minutes to heat up your gorgeous cup of coffee. Feel the homely, snug warmth of your Portable Espresso Coffee Maker in your hands as you take delight in relaxing after a day of hiking, walking, hunting or fishing. Once you use this product once, it will be hard to imagine outdoor life without it! 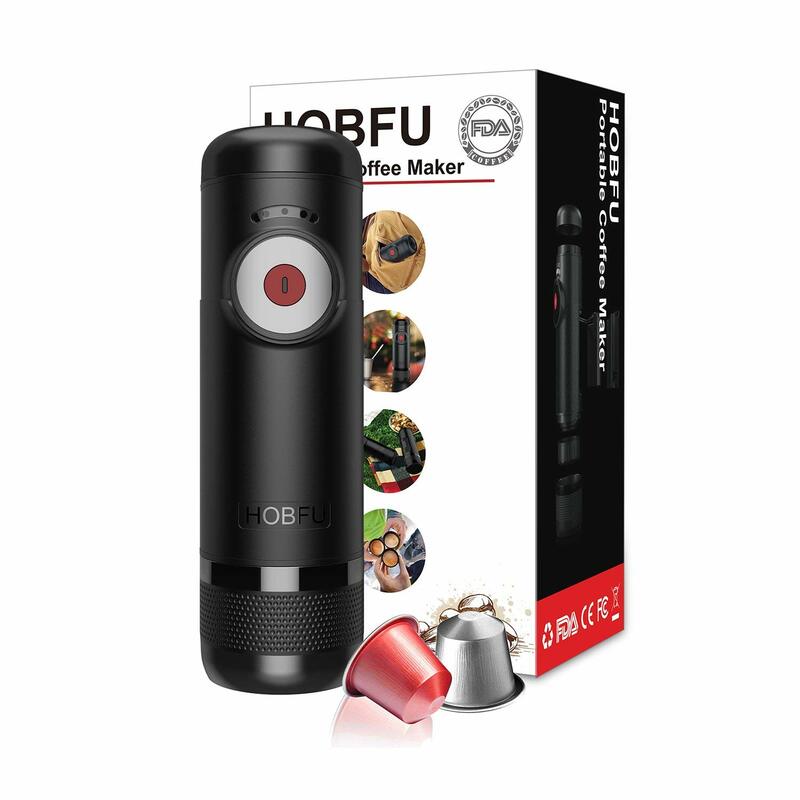 Expertly fitted with a battery indicator light, you can visually determine if your Portable Espresso Coffee Maker requires charging, allowing you to determine when coffee is convenient for you. The capsule cap ensures no leaking, and an even, regular flow of coffee after the brewing process. Just one simple flush and your capsule is ready to be used over and over again. You’ll never have to worry about excess residue, as the capsule is able to be fully unscrewed.